Earlier this year the Saudi authorities announced plans to purge the kingdom of illegal migrants. In July, King Abdullah extended the deadline for them to “regularize their residency and employment status [from 3 rd July] to November 4th. Obtain the correct visa documentation, or risk arrest, imprisonment and/or repatriation. On 6th November, Inter Press Service (IPS) reports, Saudi police, “rounded up more than 4,000 illegal foreign workers at the start of a nationwide crackdown,“ undertaken in an attempt (the authorities say), to reduce the 12% unemployment rate “creating more jobs for locals”. Leading up to the “crackdown” many visa-less migrants left the country: nearly a million Bangladeshis, Indians, Filipinos, Nepalis, Pakistanis and Yemenis are estimated to have left the country in the past three months. More than 30,000 Yemenis have reportedly crossed to their home country in the past two weeks,” and around 23,000 Ethiopian men and women have “surrendered to Saudi authorities” [BBC]. The police and civilian vigilante gangs are victimizing Ethiopian migrants, residing with and without visas; the “crackdown” has provided the police and certain sectors of the civilian population with an excuse to attack Ethiopians. Press TV reports that “Saudi police killed three Ethiopian migrant workers in the impoverished neighborhood of Manfuhah in the capital, Riyadh, where thousands of African workers, mostly Ethiopians, were waiting for buses to take them to deportation centers.” Hundreds have been arrested and report being tortured: “we are kept in a concentration camp, we do not get enough food and drink, when we defend our sisters from being raped, they beat and kill us,” a migrant named Kedir, told ESAT TV. 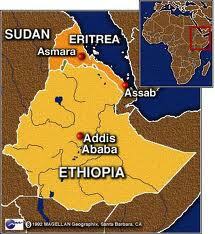 Women seeking refuge within the Ethiopian consulate tell of being abducted from the building by Saudi men and raped. ESAT, reports that several thousand migrants have been transported by trucks to unknown destinations outside the cities. There are over nine million migrant workers in Saudi Arabia, that’s 30% of the population. They come from poor backgrounds in Sri Lanka, the Philippines, Indonesia and Ethiopia and make up “more than half the work force. The country would grind to an embarrassing stand still without their daily toil. “Many suffer multiple abuses and labor exploitation [including withholding of wages, excessive working hours and confinement], sometimes amounting to slavery-like conditions”, Human Rights Watch (HRW) states. The level of abuse of domestic workers is hard to judge: their isolation combined with total control exerted by employers, together with government indifference, means the vast majority of cases go unreported. Until August this year there was no law covering domestic abuse. Legislation has been passed: however, the authorities, HRW reports “are yet to make clear which agencies will police the new law…without effective mechanisms to punish domestic abuse, this law is merely ink on paper.” All pressure needs to be exerted on the rulers of Saudi Arabia to ensure the law is implemented and enforced so victims of domestic violence feel it is safe to come forward. Although freedom to protest is enshrined within the Ethiopian constitution (a liberal minded, largely ignored document written by the incumbent party), dissent and public demonstrations, if not publicly outlawed, are actively discouraged by the Ethiopian People’s Revolutionary Democratic Front (EPRDF) regime. 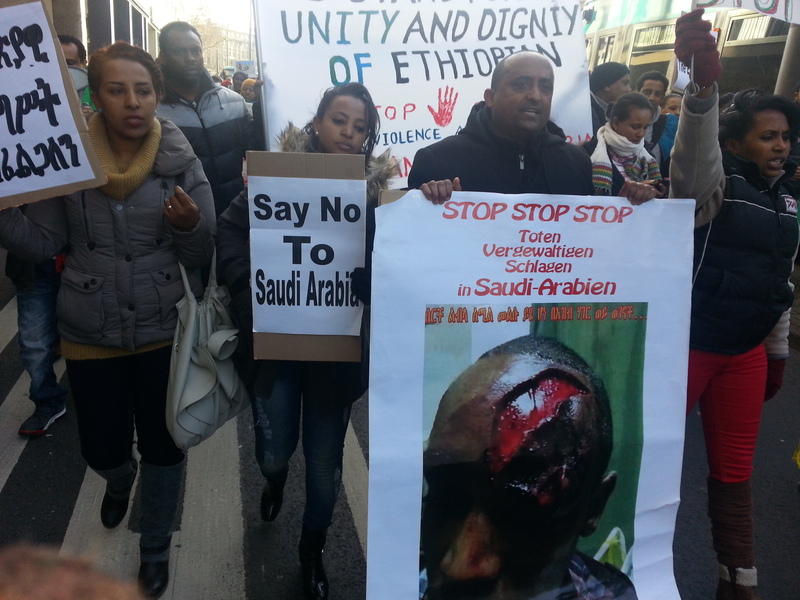 In response to the brutal treatment meted out by the Saudi police and gangs of vigilantes in Riyadh and Jeddah, outraged civilians in Addis Ababa staged a protest outside the Saudi Embassy, only to be confronted by their own police force, wielding batons and beating demonstrators. 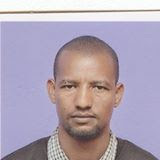 Al Jazeera reports that police “arrested dozens of people outside the Saudi embassy [in Addis Ababa] in a crackdown on demonstrators protesting against targeted attacks on Ethiopians in Saudi Arabia.” A senior member of The Blue Party, Getaneh Balcha was one of over 100 people arrested for peacefully protesting. The government’s justification, rolled out to defend yet another suppressive response to a democratic display, was to assert that the protest “was an illegal demonstration, they had not got a permit from the appropriate office”: petty bureaucratic nonsense, hiding the undemocratic truth that the government does not want public protests of any kind on the streets of its cities: effectively, freedom of assembly is banned in Ethiopia. 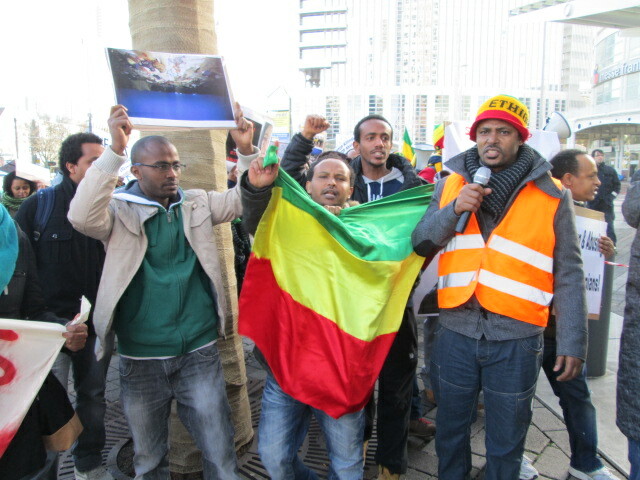 The protestors, he said, “were fomenting anti-Arab sentiments here among Ethiopians.” Given the brutal treatment of Ethiopians in Saudi Arabia, anger and anti-Saudi sentiment (not anti Arab) is, one would imagine understandable, and should be shared by the Ethiopian government. The people of Ethiopia are living under a duplicitous highly repressive regime. The EPRDF consistently demonstrates it’s total indifference to the needs and human rights of the people. Freedom of expression, political dissent and public assembly is denied by a regime that is committing a plethora of human rights violations in various parts of the country, atrocities constituting in certain regions crimes against humanity. In fact, according to Genocide Watch, the Ethiopian government is committing genocide in the Somali region, as well as on the “Anuak, Oromo and Omo” ethnic groups (or tribes). The recent appalling events in Saudi Arabia have brought thousands of impassioned Ethiopians living inside the country and overseas onto the streets. This powerful worldwide action presents a tremendous opportunity for the people to unite, to demand their rights through peaceful demonstrations and to call with one voice for change within their beloved country. The time to act is now, as a wise man has rightly said, “nothing happens by itself, man must act and implement his will”.